The forecast is for a high of 23 C, almost 75 F. We took the bus, shopped at the Intermarche grocery store, returned on the bus all in less than an hour and a half. Sandy spent awhile continuing to wash windows, window sills, frames and the frames of our awnings in the back or west side of the apartment. With warm temperatures predicted all week, she wanted the windows clean and cobweb free. We also bought a large bottle of Monsieur Prop, Mr. Clean, this morning. When the pigeons are gone there will be a lot of cleaning to do on the balcony. We went out to the harbor late in the afternoon and discovered Alain finishing up a boules game. It was very pleasant in the shade with a fairly cool breeze. Sandy peeked around the curtain to see how the squab was doing before bedtime. Unfortunately it did not survive. Today’s high temperature forecast is for 27 C. Hot for Saint-Malo. Sandy shopped at the marché for fresh fruit and vegetables. Later, we took the 10h03 #6 mini bus to the Saint-Servant marché to go to the butcher. We wanted to buy ground beef and some sausage meat to make meatballs. We also bought some chicken breasts. We walked home down the hill and could tell it was going to be a warm day. There seem to be many more tourists around. Apparently many arrived Sunday or yesterday. You can tell because they’re uncertain where they’re driving, frequently making wrong turns on one way or dead-end streets. Then they have to back out causing traffic jams. In the afternoon we went to the beach. We took water shoes and walked in the ocean in mid-calf deep water. It was still surprisingly cold, but the day was sunny warm and refreshing. Phil spent almost an hour cleaning up our balcony this morning. Good thing we purchased a large-sized bottle of Monsieur Prop! We can finally put our table and chairs on the balcony and enjoy it ourselves. Sandy is glad to have the railing to hang our clothes drying rack from the sides. The forecast is for a high of 28 C. Another hot day. Phil made meatballs and Sandy spent the rest of the morning cleaning the french doors to the balcony. We spent over an hour walking in the ocean in the afternoon. It’s such a great way to stay cool and get some exercise. We enjoyed Phil’s meatballs for dinner. The warm forecast continues. Sandy opens all of the french doors and windows of our apartment when she gets up in the morning. Then as the sun rises over the walls and buildings we close the windows and shutters to stay cool. So far, this has worked. Sandy was pleased to see the madam at La Fournee Malouine when she shopped for our breakfast. The boulangère (female baker) said she’d had a great vacation. During her vacation a terrace had been installed in the front of her store. Sandy made several unplanned trips down our stairs. She was continuing to clean our balcony using the broom. The head of the broom, the part with the bristles, shot off the handle and fell to the ground. She ran downstairs to retrieve it. The broom needed some repairs. Next she washed the french doors on the outside while standing on the balcony. The wind had become much stronger and before she knew it, her roll of paper towels blew to the ground. Downstairs she went again to retrieve them. Finally finished, we decided that it was so nice and cool we didn’t care to wade in the ocean. We took our chairs to the harbor at low tide and watched the water rise. The Armorique, a ship we hadn’t seen before arrived to wait for the locks to open. It is a ship that manages the lighthouses and buoys. It had come from Roscoff, France. By the time the locks opened, 2 hours prior to high tide, there were 12 boats waiting to enter the lock. At the La Fournee Malouine this morning to purchase our breakfast Sandy saw the new tables and chairs on the terrace. They look very pretty and will be enjoyed for sure. After breakfast Sandy shopped at our marché for fruit. She knows the “routine” by now. If you want to purchase fruits and vegetables you wait, sometimes in line, for Monsieur Alix or his helpers to serve you. You only help yourself when directed by him with a “servez-vous,” serve yourself. There were two people in line in front of Sandy. An English gentleman that had helped himself to leeks and was standing there holding the leeks and his money waiting to pay. Another local lady was waiting in front of Sandy. Monsieur Alix helped the local lady in front of Sandy. Then he helped Sandy. The English gentleman was ignored until after Sandy left and there wasn’t anyone else in line. He will learn the routine quickly. We took the bus to Intermarché to buy ice cream drumsticks to enjoy for the weekend Our favorite flavor is a chocolate and pistachio twist. Delicious! Our friend Alain stopped by after lunch to deliver some sad news. 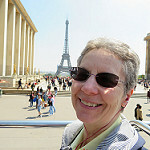 Our friend Jean, who we had visited in May in Paris, had died during the night. Tough news for us. But even tougher for Alain. Jean was Alain’s cousin, but more like a brother. Around 16:00 we walked to the Plage de l’Eventail to walk in the water. The tide was just beginning to come in and we walked quite a ways on sand to reach water. The water was very clear and cool-refreshing! On the way back, we passed a group of people walking down the street who had purchased galettes for a snack. A lady had her galette on a paper plate in her hand. We watched a gull swoop down from the sky and grab the galette. The gull dropped it on the ground in front of the lady and took a few bites. It was very amusing to see, although the lady seemed very surprised and not very happy! The forecast is for hot again today. So far this week, we have avoided real hot days. There has been a breeze out of the north keeping the temperatures pleasant, even with the sun shining. After breakfast we decided to walk in the ocean around noon before low tide. We wanted to avoid walking through a block or more of beach to reach the water. The clouds came out, the wind was from the north, and the temperature was around 20 C or 68 F. We went to the beach anyway. The sun came out making us feel warm but was very comfortable. The forecast changed to reach a high of 26 C. With our windows open to dry sheets, it seemed like a hurricane was blowing through our apartment. Both Paris, France and Holland, Michigan are under excessive heat warnings today. Fortunately here in Saint-Malo we are not. For dinner we went to Chez Marcel’s for kebab sandwiches, frites and Orangina. Sandy wore a windbreaker since the wind was still strong. We arrived shortly after 19:00 and he was not quite ready to open. Everything was delicious as usual. After eating we walked to the esplanade Saint-Vincent. Tomorrow is July 1st and we will need new bus passes. The new cards and automated machines make it very convenient to renew for the month. We’re ready for tomorrow! We were woken up during the night by thunderstorms. Usually living in a building made of granite we don’t hear too much. The thunder and lightning must have been loud. La Fournee Malouine was extremely busy this morning. A group of bicycle riders had just arrived from the UK on the ferry. Every table in the back was occupied. They all ordered coffee and something to eat for breakfast and were buying sandwiches for lunch. The two tables in the front were occupied by two Asian couples. Sandy was 5th in line and by the time she was ready to leave the line was out the door. Great business today! Just got a text that Michael had landed at CDG airport in Paris. Good! In the afternoon we walked down to the harbor. We took our camping chairs so we could sit in the shade of the trees. Most of the benches are not in the shade. Also they are wood and very rough on the bottom. A dog and its owner were in the harbor area exposed by the low tide. The dog was having a great time going in and out of the water. Just got a text from Michael that he had checked into his hotel. Great! Love reading about all your adventures and news about the police activity. You finally found curtains.? I’m due back in Michigan this coming Saturday. My fun vacation is ending. It’s super hot at home. Maybe I should stay in cooler Scandinavian countries ! !